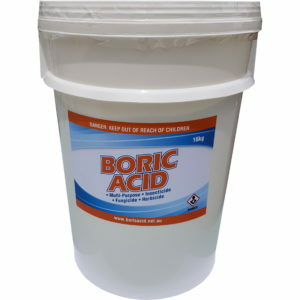 Why buy boric acid from us? We are the best supplier of boric acid! Here’s a few reasons why. 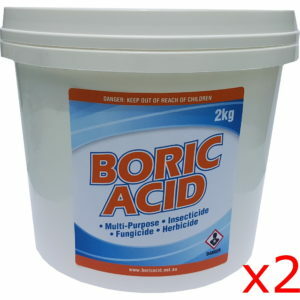 There are a number of places where you can buy boric acid. But we are the best! Here’s a few reasons why. 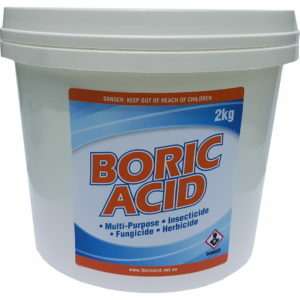 We’ve source the best possible boric acid. Ours is from Argentina and is, in our opinion, the best quality technical grade by far. It’s 99.5% pure which is excellent for the grade. It’s also a very soft powder when compared to the other sources we’ve tried. This makes it really easy to work with, especially if you need to dissolve it. We don’t use the boric acid from China. It is terrible. It comes in big chunks the size of fists and are as hard as rocks. It’s effectively useless for household purposes. The packaging they used leaked, which mean boric coming out and dirt getting in. And boy was the packaging filthy. It was like it’d been left out in a dust storm. We also don’t use the boric acid from Turkey. While the packaging was a lot cleaner, the boric acid itself was also packed together into large rocks. Completely unsuitable for household use. We use proper plastic tubs and containers specifically designed to contain chemicals. They’re very sturdy and safe. They also make for easy storage and access. Our sizes from 1kg and up include a scoop, like what you get with your laundry detergent. This makes it super easy to use. We used to use vacuum sealed commercial pouches but found they compacted the boric acid. The tubs are far better. We don’t use plastic supermarket snap lock bags that some other use. Watch out for those. They’re terrible. The lids on all of our products have tamper proof seals. This handy for all the typical reasons but I like it because it tells me which tub I’ve opened. 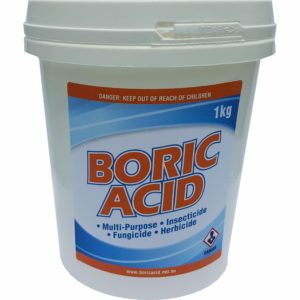 We use a lot of boric acid and we have a few tubs in the cupboard. We go to great lengths to ensure your boric acid arrives safely. We vigorously test each tub and the packaging to ensure it’s integrity. 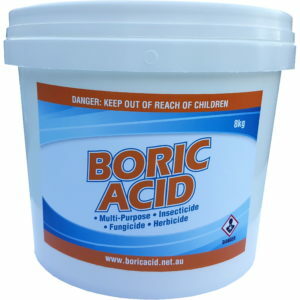 We stand by our boric acid and believe it’s the best you can buy. Which is why we offer a 3 month warranty on all of our products. Adding to our warranty, we offer a 30 day unconditional guarantee on our 400g jar of boric acid. If for any reason our product is unsuitable for use we’ll replace it for free or refund your product purchase price. We have published a number of “How to” guides on our website. They’ve been put together by me (Louise) and are free. 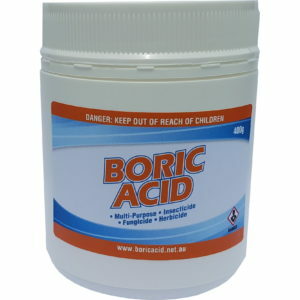 We also offer email support about boric acid. You don’t even have to be a customer of ours, we’re quite happy to help. We produce all of our products right here in Melbourne. We also source all of our materials and from local suppliers. The containers, the labels and everything that we use for processing is purchased from companies right here in Melbourne. The only thing that is not Australian made is the boric acid itself. Unfortunately Australia has little to no Borax deposits (what boric acid is made from) so we have no choice but to use imported goods.